Paulo Lage (3rd from L), general manager of Seaview Equipment LLC, and Joanna Tromczyk (5th from L), head of sales of Engcon North America, shake hands while Krister Blomgren (far R), CEO of Engcon and other company representatives look on. Engcon North America has appointed Seaview Equipment LLC, located in Bridgeport, Conn., as its dealer. 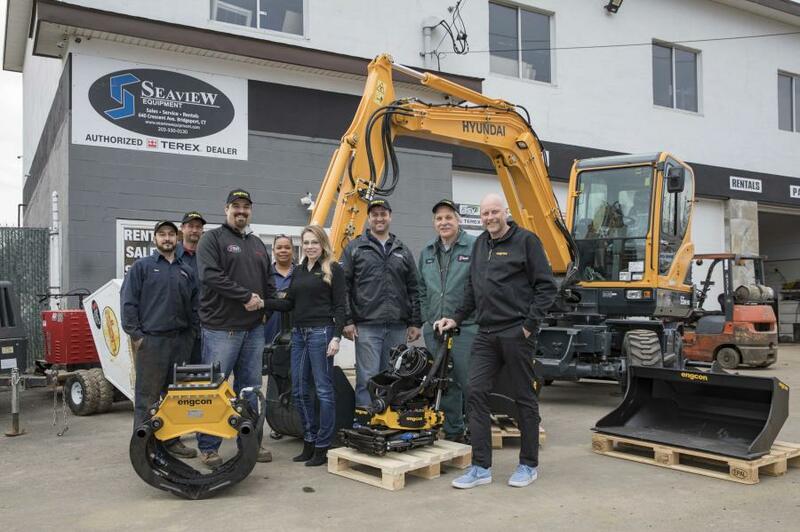 Engcon chose Seaview as its dealer because, in addition to being geographically well positioned, "Seaview is well known and respected in the industry for their exceptional customer service," Joanna Tomczyk, director of sales of Engcon North America, said. "Seaview values aligned seamlessly with Engcon core values." "When Seaview Equipment was presented with the opportunity to represent the Engcon brand, we felt it would complement our line of excavators and offer our customers a great solution for various projects," said Paulo Lage, general manager of Seaview Equipment LLC. "For example, road projects would allow an end user to need less equipment on site, reduce work and down time and use less man power, which in turn generates more revenue. Since partnering with Engcon, we have seen a substantial amount of phone inquiries come our way." Among the Engcon line being carried by Seaview are tiltrotators, which help reduce the need for repositioning an excavator, reducing work time, wear on the excavator and fuel consumption. "With a tiltrotator on the excavator you save lots of time because you do not need to reposition the machine the whole time," said Sten Stromgren, Engcon communications manager. "You do not need to close as much workspace or streets with a tiltrotator on the excavator. You can reduce the manpower and then you get a safer workplace. Reduced need of closing streets and reduced need of manual manpower means that you save lot of money. "The precision of digging also reduces trenched material and the amount of refill material," Stromgren said. The tiltrotator also works in conjunction with an assortment of tools, including pallet forks, grapplers, compactor plates and grading beams. "Many customers say the excavator will be like a Swiss Army Knife with an Engcon tiltrotator," Stromgren said, adding "You will also find new ways to use the excavator when you have the tiltrotator on it." Seaview Equipment is a full-service dealer of Hyundai Construction Equipment, Yanmar and ASV skid steers/track loaders, and now Engcon. For more information on Seaview Equipment, visit www.seaviewequipment.com.